Freshman Noah Niznik tosses a pitch in his first collegiate win against Western Illinois on Saturday, Feb. 23. Southeast baseball team dropped its first series of the season this past weekend as Western Illinois University won the series two games to one. The Redhawks won the middle game of the series, 14-2 on Saturday, but dropped the opener 14-2 on Friday and the rubber game 5-2 on Sunday in 11 innings. Each game followed the same trend, with WIU striking first. In a pivotal third game, the Leathernecks scored in the first inning. The Redhawks pulled even in the fifth inning with an unearned run when Peyton Faulkner scored on an error. Both teams scored one run in the eighth inning. The Leathernecks scored on a wild pitch and the Redhawks scored on a two-out RBI single by senior third baseman Alex Nielsen. In the 11th inning, Western Illinois loaded the bases with nobody out on a leadoff single, a walk and a fielding error CJ Schaeffer brought a run in with a single and Kevin Raisbeck followed up with a double, bringing in two more runs. Carberry came on to retire the Redhawks in order in the bottom of the inning. Bergtholdt took the loss for Southeast, which fell to 5-2 on the season. The Redhawks were 4-0 on the season entering the series. The Leathernecks have entered the series 0-3 on the season. In the first game of the series, WIU scored runs in five innings. Western Illinois led 3-1 in the fifth inning when Drue Galassi hit a home run. The Leathernecks added a run in the frame. One inning later, Galassi crushed a three-run homer, to extend the lead to 8-1. Dylan Dodd, the first of four Southeast pitchers, took the loss. He allowed five runs — four earned — over 4 2/3 innings. He gave up seven hits, walked one and struck out one. The Leathernecks finished with 10 hits. 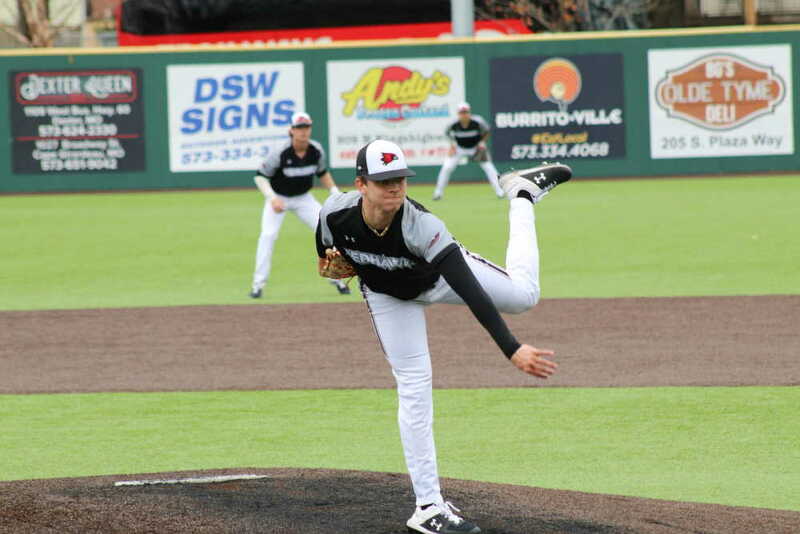 The Redhawks had eight hits overall by eight different players off two WIU pitchers. WIU starter Javin Drake threw the first 5 innings and recorded the win. In the second game of the series, WIU scored both its runs in the second inning in taking a 2-0 lead off starting pitcher Noah Niznik. The lead didn't last for long as Southeast junior first baseman smacked a three-run home run off WIU starter Alex Dorethey in the bottom of the inning. Southeast blew the game open with five-run frames in the fifth and sixth innings. Niznik, a freshman left-hander, struck out four batters and allowed five hits in five innings, in recording his first collegiate victory. Nathan Bock and Chase Hegarty held WIU scoreless for the remainder of the game with four innings of one-hit relief. Southeast had 11 hits in the game, which were helped by five walks and five hit-by-pitches by three Leatherneck pitchers. Tyler Wilber, Wade Stauss, and Alex Nielsen combined for seven hits. A number of runners were left stranded throughout the series. The Redhawks left 11 base runners stranded the first game and 14 stranded in the final game. Southeast will play host to Purdue Fort Wayne in a three-game series beginning at 1 p.m. Friday, March 1.